See bottom of the ad for trades. Powercoated frame and swing arm. New Clutch cable new with billet ez pull lever. New chain sprocket and slider. Billet throttle cover. Billet ebrake block off. many one off billet parts. Many more small things not listed. This quad has all new stainless grade 5-8 fasteners. It is one if a kind. I am happy to answer questions but please do not waste my time if your not a serious buyer. I will show it to you but there will be no test rides without you placing the cash in my hand. Outstanding like new condition, starts 1-2 kicks, runs awesome, rides great, needs nothing but a new owner. Price is firm do not contact me to offer less. I love this quad and happy to keep it. Try and duplicate it for that price. 2 extra axles, hubs, extra set of front/rear tires, extra brake calipers, cdi and many more parts. I would be happy to answer questions through text or email. 3800$ as shown. The Autolite and FRAM stickers and number plate stickers are easily removed from the white plastic and that body work has only been used in shows. 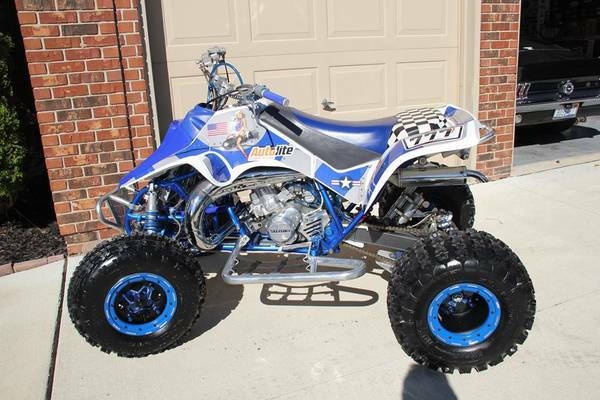 Trades considered?-2006 or newer Suzuki LT450R, Yamaha YFZ450R, Honda TRX450R, Honda TRX250R in similar condition or needs work condition trade plus Cash Also interested in Roketa, Joyner, Dinli, ODES buggies. Yamaha YZR1000 needing work. 250R Honda Suzuki Yamaha Kawasaki Will trade your quad needing work plus cash too.